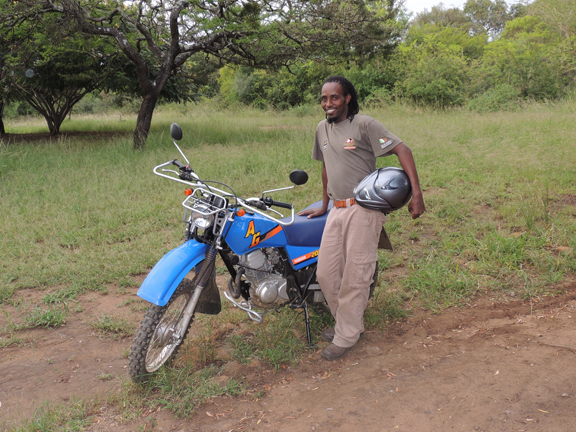 Wildlife ACT Fund’s Zama Ncube has a great new motorbike! 2013’s Race 4 Rhino team, lead by Scott Irving, managed to raise R167 925.00, of which R 40 000.00 was spent on the new Yamaha AG200 to aid Zama’s monitoring duties. This will help the black rhino monitors of Somkhanda to be more efficient in their fight for rhino conservation. The rest of the funding is being used to run the operation; covering fuel, much needed vehicle repairs, uniforms and equipment. Thank you to Race 4 Rhino and everybody who contributed towards this fantastic donation.